Last week, we announced the launch of a new, interactive tool to aid in the college-going process. 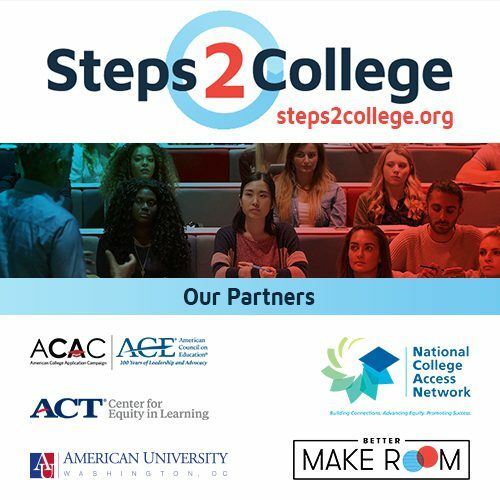 Steps2College, a partnership among the Center, American College Application Campaign from the American Council on Education (ACE), American University School of Education’s Center for Postsecondary Readiness and Success, Better Make Room, and the National College Access Network (NCAN), is a one-stop resource for everything high school counselors, students, and family members need to support students through the college-going process. Steps2College focuses on four key milestones in the journey to college from the application process to applying for student aid to making a decision to navigating the transition. Each milestone has corresponding resources to support the efforts, whether you’re a student or an advising professional. The site also offers the opportunity to explore events like Twitter chats and ACT Test dates, as well as a resource center where visitors can filter the items of most interest based on their role and where in the college-going process they are. There’s also a downloadable PDF overview of the four milestones that can be printed and shared. We invite you to explore and share Steps2College with your networks and anyone who is involved in the college-going process. It doesn’t have to be difficult – if you know the Steps2College!